Samuel Rownd, Sr. first came to what is now Cedar Falls in 1850. He liked the area and began to acquire land. By 1859, when he moved his family to Cedar Falls and settled permanently, he owned 4,000 acres. He and his family eventually owned nearly all of what is now College Hill and Cedar Heights, as well as additional land to the south of town. Rownd began building the house in 1865. It was expanded and modified during the next 30 years, reaching completion by 1895. The presumed foundation of an earlier house can be seen in back of the existing building. The house was built of limestone (possibly quarried at 18th and Main in Cedar Falls) in the Queen Anne style. The two-story house features four bedrooms and oak woodwork. 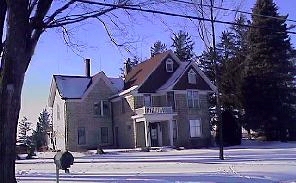 The house remained in the family until 1945, when Dr. Cecil Adamson purchased it from the estate of Kathryn Rownd Kreger, a granddaughter of Samuel Rownd, Sr. Today, the home is a private residence.